The 23-year-old has been in fine form for the French outfit this term and he has contributed eight goals and seven assists from just 13 league appearances. 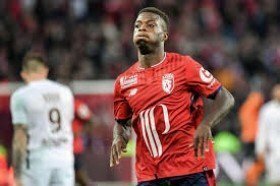 As such, he has caught the attention of some of Europe's elite but according to The Times, the Gunners are said to be leading the race to land the Ivorian attacker. Unai Emery's side are likely to be without Danny Welbeck for the rest of the season with a long-term ankle injury and this has encouraged the need for a replacement with Pepe topping their shortlist. The north London giants are planning a bid of around £27m for the former Angers man, though that may not be sufficient to lure him with Lille said to want a fee in the region of £40m.